The name Sant'Agata comes from the Patron Saint, while "Bolognese" reminds the disputed location of the town situated half way between Bologna and Modena. 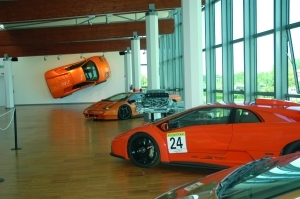 Sant'Agata Bolognese is a lovely plains village, 6 kilometres from San Giovanni in Persiceto, known the world over for the automobile producers, Lamborghini and its Museum listed in the "Land of Motors circuit". In the historical centre, you should not miss a visit to some of the most significant monuments in the Bolognese territory. The Parish Church, as well as housing a portrait of Sant'Agata attributed to Guido Reni, contains the detached frescoes of the Oratory of the Spirito Santo (Holy Ghost), masterpieces of 16th-century art. Created around 1520 by artists of refined Raffaello-esque style (the names of Nicolò dell'Abate and Bagnacavallo have been suggested), the frescoes consist of life-size figures of the Redeemer and the Apostles. In 1905, the Oratory was declared a national monument, as was the village tower. It can be visited with prior booking. The Bibiena Theatre is also very interesting, one of the territory's small jewels. The main feature of this theatre is how small and intimate it is (only one hundred seats in elegant stalls), a characteristic which has led to the choice of particularly cultured activities. A few kilometres from Sant'Agata, there is Nonantola and its Abbey, visiting which means crossing once more into the territory of Modena. Antique market "Svuda la canteine", (empty the cellar): second Saturday of eache month. Befane (a witchlike figure associated with Epiphany), traditional burn of the old woman, in Maggi: January 5th. Flowers Festival and hand pushed Barrows' Race: first Sunday of Mat. White Night at Porta Otesia: second half of September.